Ladies white stuff purple tunic, 3/4 length sleeves, size 12. Condition is Used. Dispatched with Royal Mail 2nd Class. White Stuff Cotton Dress Size 12 Purple. Worn but plenty of life left. Smoke and pet free home. This is a Mistral V-Neck Floral A-Line Dress inUK size 18 in Stretch Viscose Jersey (Photos 1-8). The A-Line dress is calf length. The fabric is 100% Viscose & the sleeves are cap sleeve. The floral leaf colours are purple, pale lilac & olive green (see photos 1-5). Jersey cotton with bottom frill, length 31”, pit to pit 19”. Great condition. White Stuff Long Sleeved Top Size 12. Striped back. Condition is Used but immaculate. Dispatched with Royal Mail 1st Class. White stuff tunic top size 16. Condition is Used. Printed white stuff tunic with people - see photos. From a smoke & pet free home. White Stuff Ladies Jumper Size 8 Fabric Mixture including viscose,nylon,lambs wool,angora,cashmere Condition is Used. White Stuff Tunic Top 14/16. Condition is Used. Dispatched with Royal Mail 1st Class. Versatile tunic with scalloped hem and embroidered flowers , please note tags have been removed and there are a few snags to the fabric but they do not notice. Underarm measures 23 so a generous fit, length 27 ins please message with any questions and take a look at my other items as I am always happy to combine postage. Please note that I am not liable for items lost in the post, I always get proof of postage which I can forward on in the event of a problem. White stuff pretty butterfly print tunic top size 10, bust across 19ins/length 26ins, in vgc. White Stuff, womens, tunic, tropical leaves print,green and purple size 18. Two pockets on the front.Condition is Used. Dispatched with Royal Mail 2nd Class. White Stuff T Shirt Size 8 . Condition is Used. Dispatched with Royal Mail 1st Class. Size 12 White Stuff Purple Cord Skirt, sits above the knee. Condition is Used. 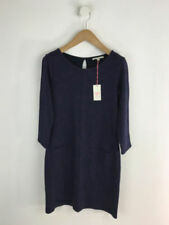 BNWT White Stuff Falling Leaves Shift Dress - Sz 16. Condition is New with tags. Dispatched with Royal Mail 2nd Class. This beautiful fun and feminine tunic is made from a breathable lightweight jersey material. It falls just below the knee in a loosely fitted way. It features a woven panel across the bust which is in a different print and a pretty pleating detail. Ladies White Stuff Tunic Top / Dress Size UK 8 purple trees. Has two pockets, ties at the back and a shell button detail. Flattering empire line cut. It is in a good used condition. Styles well with a plain ensemble. Constructed from a soft velvet material, this piece combines retro chic with contemporary styling accents. It features a flattering V-neck shape and is cut to a relaxed fit, finished with delicate gold foiling detailing, perfect for casual weekend attire. Oh so pretty White Stuff light lavender shade floral viscose looser fit top size 8 in good clean used condition. Button to the back of the neck. Gather to one shoulder. Length from shoulder to bottom hem is 26 inches. Chest measures 18 inches across from underarm to underarm laid flat. Smoke free home. Super cute top from white stuff with 3/4 length sleeves and gorgeous bird and leaf pattern. Button and stitching detail to the front and a very flattering round neckline make this top a super cute bargain. Check out my other items as I'm having a massive clear out. Any questions please ask. 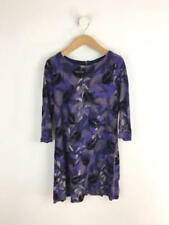 White Stuff Floral Purple & Navy Jersey Style Dress Size 18. Condition is Used. Dispatched with Royal Mail 2nd Class. White Stuff Purple & Grey Multi Print stretchy Dress UK 10 . Condition is Used. Dispatched with Royal Mail 2nd Class. 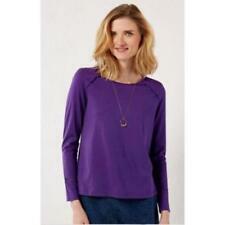 White Stuff - size 14 - short sleeved dusky purple top - preowned in good condition. 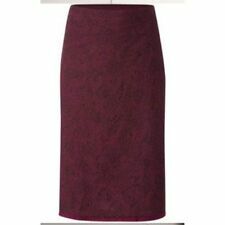 Lovely plum coloured dress, large side pockets, length 42”, pit to pit 21”, across line at waist 18” relaxed. Material very stretchy, it’s viscose but feels like jersey cotton. WHITE STUFF NAVY PURPLE URCHIN JUMPER SIZE 18. Condition is Used. Dispatched with eBay delivery – Shutl 2-3 days. In fabulous condition, boat neck, 3/4 length sleeves with turned up cuffs & has two lovely pouched pockets on the skirt area above the hemline. With stretch for a great fit & in a simple pull over the head style so no fastenings to worry about. White Stuff Tunic, Size 14, although I removed the size label. Good condition, can be buttoned at the back to give more shape. PayPal only, no returns. Please take a look at my other items. Lightweight cotton material but not see through. Tie-front, little cap sleeves. Good used condition. From pet and smoke free house. It is a White Stuff size 12. Purple cotton 'distressed look' top in good condition. White Stuff Jumper 12. Condition is New with tags. Dispatched with Royal Mail 1st Class. white stuff dress size 16. Lovely butterfly design with a flattering cowl neck and waist detail. See my other items as looks fantastic with the matching cardigan worn over it !! Condition is Used. Dispatched with Royal Mail 2nd Class. Ladies White Stuff Purple Dress Size 8 in good used condition. The dress has a side zip, fully lined and the pattern is embroidered. The care label has been removed but the material is very easy to care for normal washing. 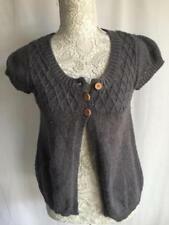 This is a gorgeous cardigan from White Stuff in a size 12. Cardigan has a rounded neckline, long sleeves that button up to 3/4 length, buttons up and looks great on. GORGEOUS WHITE STUFF CARDIGAN. Colour: purple.